Worth observing that the English word “giddy” in medieval times meant “possessed by a ‘gudo’ ” or by a god. Interesting! I had no idea. That makes the word “giddy” make so much more sense! The term “Going Beserk” comes from the Beserkers, Norse Sorcerers who could chanel dead Wolves in Battle and or even Shape Shift into them. I was reminded of them reading this. I’ve been reading a three part fanfic called The Kamikakushi Saga, a sequel to Miyazaki’s Spirited Away. One of the main characters that Chihiro gets involved with is a woman who ‘owns’ a fox spirit. She sells her onsen to Chihiro (among other things…). There is a lot more to it than that, but it would give away the plot. The author has reserched her subject, and I recognised the kitsune-tsukai. That’s cool! I have to say I have never read a fanfic in my life, but I respect anyone who does their research. She must have read The Catalpa Bow–it uses the term “fox owner” instead of “fox user,” but I personally think that is a poor translation. Kitsune-tsukai is similar to the word maho-tsukai, or magic user / wizard, so I think fox user has a more supernatural feel. “Fox owner” just sounds like someone keeping an unusual pet! In the notes to the fanfic, the author lists the Catalpa Bow as one of her referenses. The character is a witch/priestess who is looking for a “succesor.” The fox spirit is a guardian and a helper, inherited from a predecessor, and then passed on. Hi, Zack. I love your blog. I anticipate your posts with much anticipation. By-the-by, I worked at Cornish College of the Arts for six year. It’s a small world, so imagine my surprise when the Kamikakushi Saga was mentioned in your blog comments. I’m extremely honored by that. You mention the yamabushi. It is interesting to note the majority of modern day exorcists in Japan are female shamans, as they were long ago before the influx of Neo-Confucism and Buddhism beginning in the 8th century C.E. drastically transformed the role of women in Japanese society. For a while both miko and yamabushi worked side-by-side, as seen in the yorigito rite (憑り祈祷 – There is your tricky tsuki/hyo kanji again, transliterated in text as “yo”) described in the 36th chapter of the Genji Monogatari. 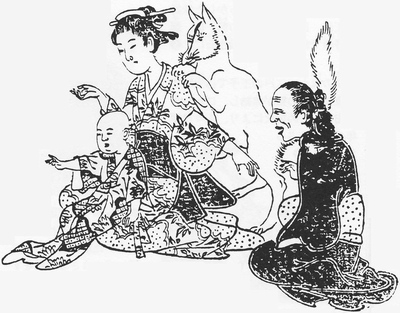 Eventually matriatical traditions were supplanted by patriatichal adaptations and the miko faded from prominence as an excorcist until the post-war religious freedom doctrine in which old traditions resurfaced. Although I mention modern female excorcists, the Nichiren Buddism Sect still holds a form of yorigito that originated from the esoteric Buddhism that gave rise to Shugendo. In it the male priest confronts the afflicting spirit directly without any involvement of a miko. It is interesting to note also that the afflicted person is usually a woman and the afflicting spirit a fox. Nichiren priests still practice austerities on Mt. Minobu in Yamanashi prefecture. It’s an strange and beautiful place. If anyone is interested in reading more about miko may I suggest the works below? All are in English. Groemer is particularly interesting as the author draws from original language primary sources created prior to the Meiji Restoration purged many documents/practices to extract pure Shinto traditions. Kawamura outlines the different traditions of shamans who learn their profession via apprenticeships versus those who are called by Kami to become healers. Smyers investigates the diversities of contemporary fox worship and their relationship to the Shinto deity Inari. Also, if you know of something I should read I’d love to heard about it. Thanks very much for all the work you do, Zack! It’s greatly appreciated by those of us with meager language skills. Groemer, Gerald. 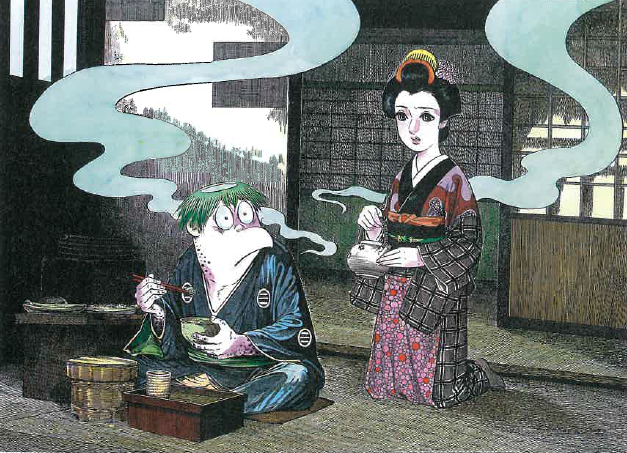 “Female Shamans in Eastern Japan During the Edo Period.” Asian Folklore Studies 66.1/2 (2007): 27–53. Print. Kawamura, Kunimitsu. “A Female Shaman’s Mind and Body, and Possession.” Asian Folklore Studies 62.2 (2003): 257–289. Print. Smyers, Karen Ann. The Fox and the Jewel: Shared and Private Meanings in Contemporary Japanese Inari Worship. Honolulu: University of Hawaii Press, 1999. Print. Thanks for all the follow-up information! That is very interesting! How do we go from a Shinto Kami of rice, money, and wealth to spirit possession? The yorigito I mentioned before has two manifestations: oracular and expultionary. 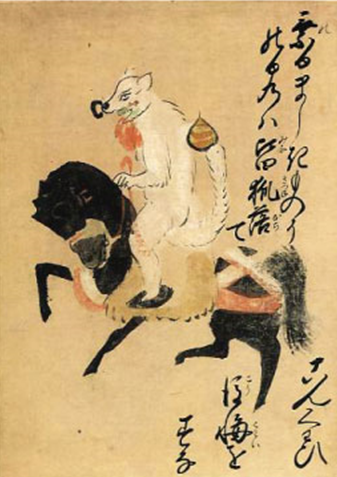 In addition to being used to cajole out and excorcise malignant spirits, yorigito is also associated with agricultural festivals that coincide with the spring arrival and fall departure of yama-no-kami and te-no-kami. 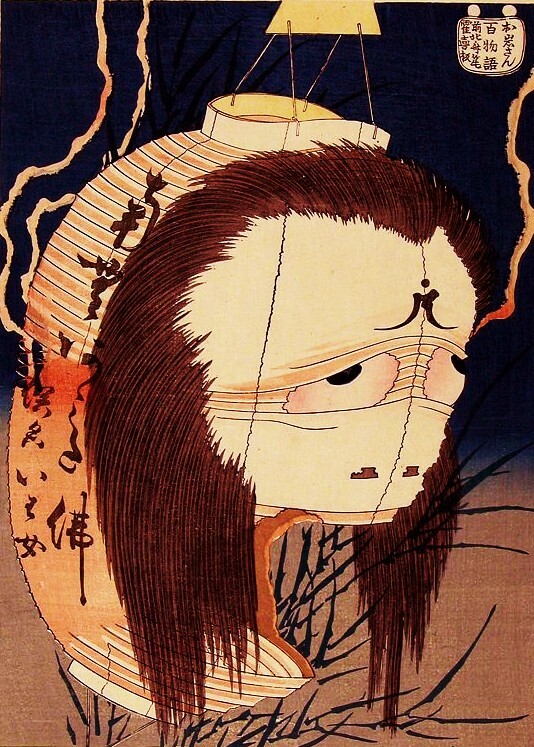 Sometimes called takusan matsuri, as part of festivities the descending deity is summoned to possess a medium and through their mouth deliver to the community advice and useful knowledge about present and future events. Banned in 1870s by the Meiji government as “supertitious non-sense”, only a few examples survive today. Yanagita (4) catalogs several in his work “Ebisu-oroshi Inari-oroshi.” So does Blacker in chapter 13, Village Oracles, of Catalpa Bow(1). 1) Blacker, Carmen. The Catalpa Bow : a Study in Shamanistic Practices in Japan. Richmond: Japan Library, 1999. Print. Pgs.252-278. 2)Fushimi Inari Taisha. Komuhoncho, ed. 1969. Fushimi Inari Taisha: shinko no kaisetsu. Kyoto. pg. 42. 3) Smyers, Karen Ann. The Fox and the Jewel: Shared and Private Meanings in Contemporary Japanese Inari Worship. Honolulu: University of Hawaii Press, 1999. pg. 227. 4) Yanagita, Kunio. “Ebisu-oroshi Inari-oroshi,” in Miko-ko. Teihon Yanagita Kunio Shu, vol.9, pgs. 243-4. Interesting. I’m re-reading CLAMP’s manga xxxHOLIC (which is decidedly Shinto in mythological orientation). The protagonist’s protecting spirit is a “pipe fox,” which is by turns a large nine-tailed fox and a thin furry snake/worm creature. Perhaps the mangakas were thinking of Inari-san’s complicated links with animals. I’ve never read xxxHOLIC, but “Pipe Fox” is another one of the regional names given for the magical kitsune. It sounds like they combined a few pieces of folklore–the nine-tailed fox is an entirely different creature. Yes, CLAMP deliberately takes a radically different approach from Mizuki, using many of the same yokai/yurei types (and also W. W. Jacobs’s “The Monkey’s Paw”) but giving them all a contemporary visual and narrative make-over. It begins well (I used to use a volume in my “World Mythology” course), but I suspect the creators lost interest in it over time, as the story begins to ramble and finally peters out. Still introduced many interesting Japanese legends and customs to US audiences. Halloween isn’t for a few more months, but Obon is right around the corner in Japan. Check out the Hyakumonogatari’s article about tsukimono (possession) in Japan. I had no idea about the link of kitsune-tsukai and dowa (同和) discrimination! 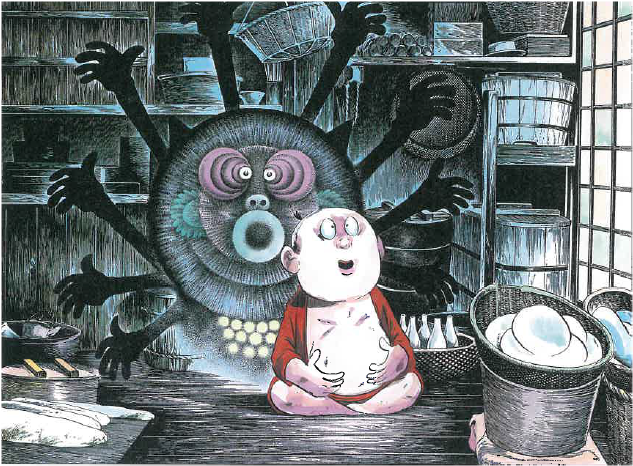 What’s your favorite spooky Japanese legend or horror story? Hi Zack! There is something that desperately needs clearing up when it comes to the Bakemono called Hebi (Snakes). 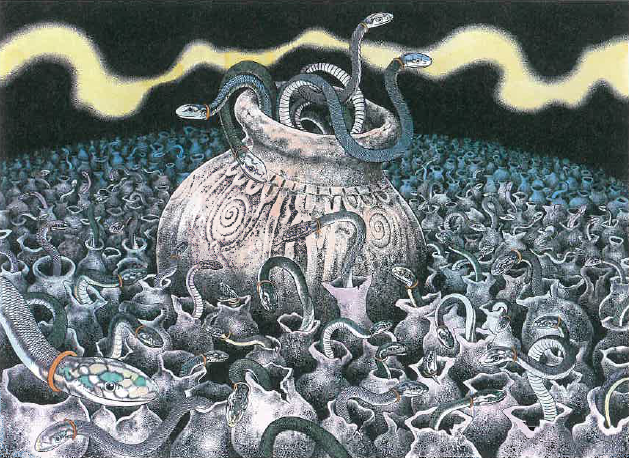 I realize there is some monsters like the Nure Onago that take on Snake-like qualities, but it is so hard to tell if one is just a Onyro or a Bakemono when it comes to Snake-Women yokai. Is there is clear difference or is it blurry? Classification seems really difficult when it comes to yokai in general because you would get different answers from different sources. 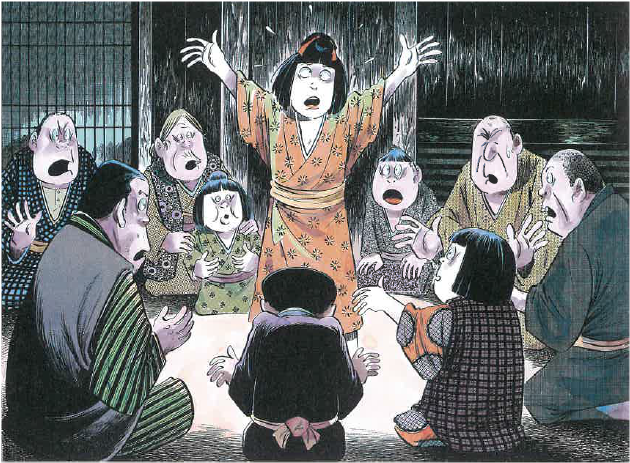 I had to break my own rule by using modern terms to describe specific yurei like Batsu-Yurei (Punishment) and Jama-Yurei (Annoyance, but not evil) since some didn’t fit anywhere else.